This is a trendy hairdo suited for the summer season. The locks are pulled back with the exception of a few strands on the sides that create the dramatic appeal of side bangs. The pulled back locks end in a messy doughnut that has the elegance of a French twist. The hair sports dark brown as the base note and has glamorous golden blonde highlights. 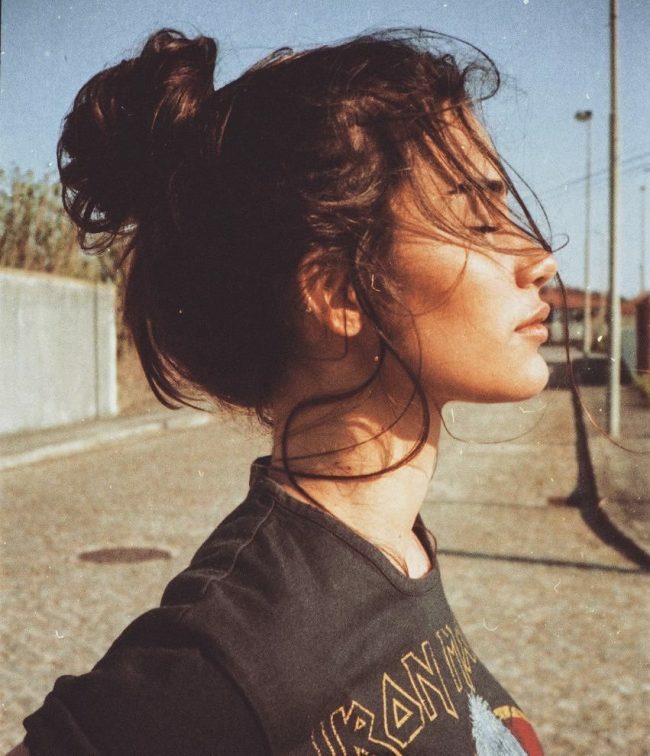 This messy bun requires you to have plenty of length. 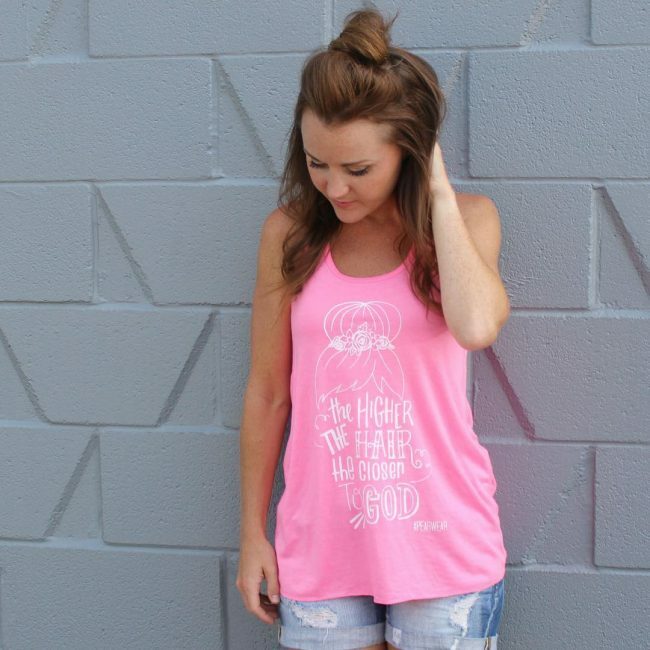 This style sports the elegance of a French braid that adorns the back. The top is styled into a bun that sits wonderfully at the crown. It has a loose twist with flyaways that give it that soft appeal. A navy blue bow tie is added to boost the fabulous look of this hairstyle. The hair sports an ash blonde tone. This style is a perfect match for women with long hair. The locks are pulled into a loose bun located at the crown. Lots of strands are left at the front to create more drama and add some swag to this style. It is definitely an elegant take for women with medium hair. 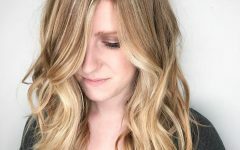 This hair is given tons of texture and styled into elegant waves. The strands at the front are given a spiral twist and pulled to the back to form a cool halo braid. The twisted strands end in a chignon that makes it unique and even more elegant. The hair sports a blonde tone. This style requires you to have long locks. This style provides the convenience of a soft and delicate touch. The locks are pulled up into a high bun. They create the illusion of a doughnut that gives this hairstyle that yummy look. The style sports lots of flyaways and has the glow of a golden blonde tone. It is a brilliant idea for those that are blessed with medium to long hair. This hairstyle sports the elegance of a spiral twist. 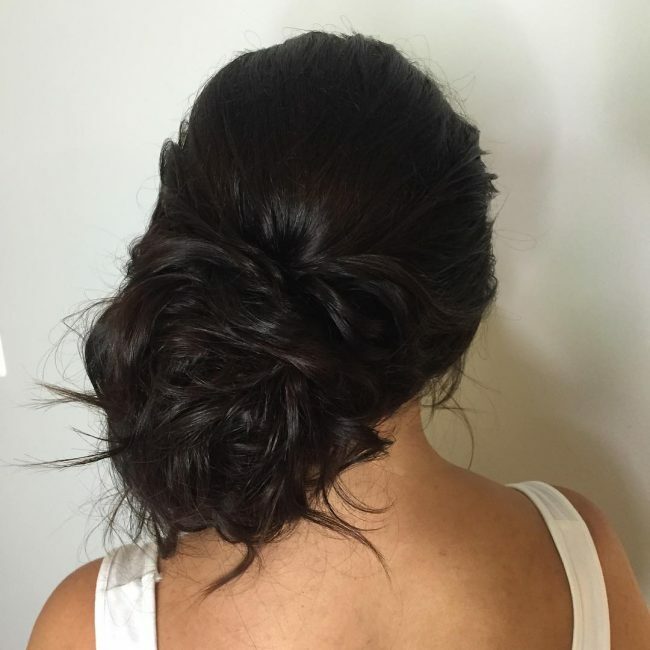 The pulled back hair end in a loose and low bun. The style has lots of flyaways that function well in providing that soft appeal ideal for summer. This style is a perfect match for a wedding party. The hair comes in a dark brown tone. 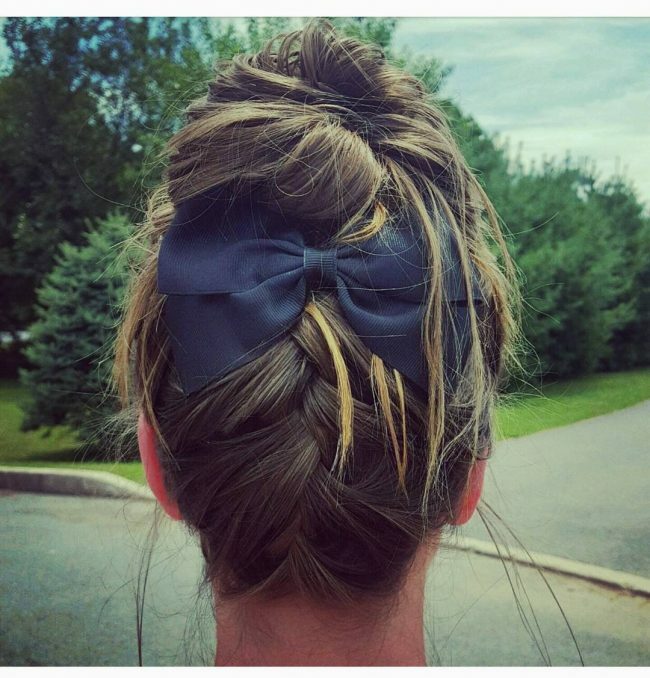 This is a cool take on a messy bun. One side is styled into a low bun while the other side sports the elegance of a French plait. The chunky plait provides a perfect wrap around the base. Lots of curls are needed to pull off this style. The hair sports ash blonde tone. 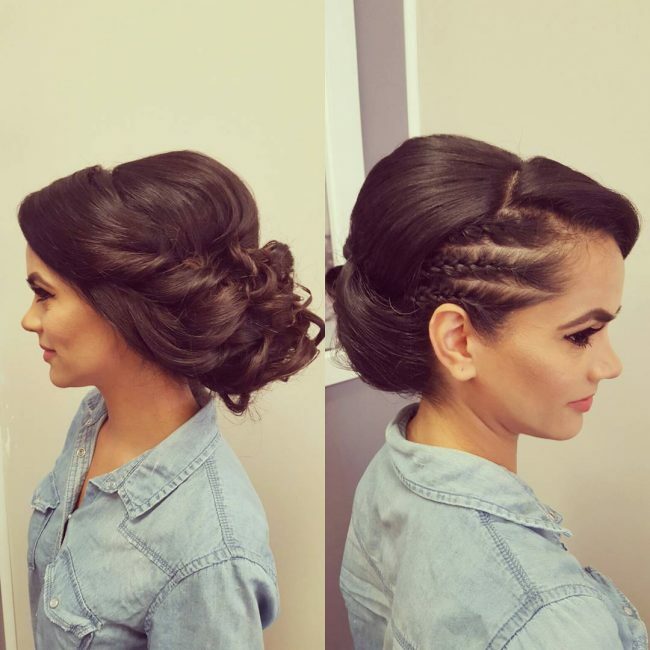 This style calls for medium to long locks and can be a great idea for a wedding party. 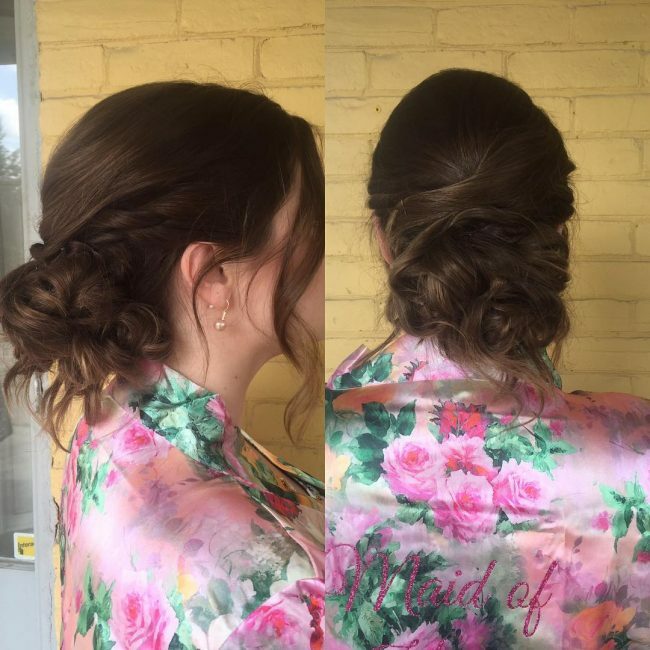 Here is a pretty cool hairstyle that is simple and absolutely beautiful. It sports textured hair that is pulled up into a bun. 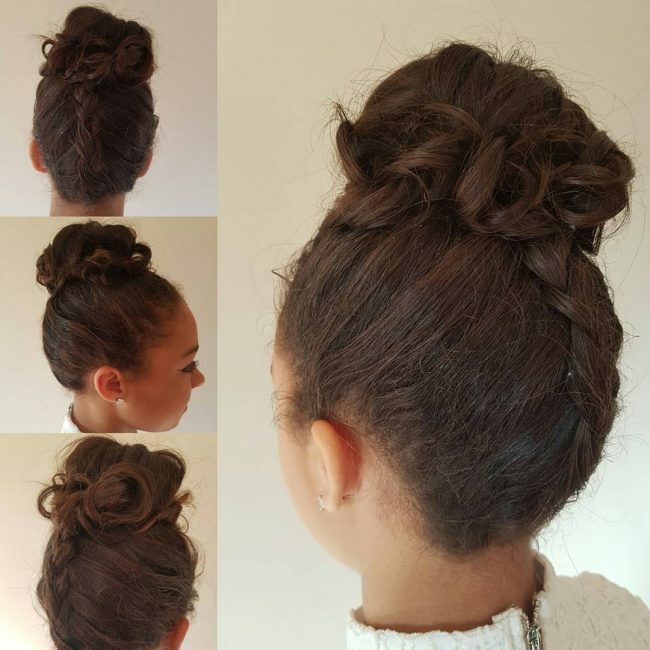 The bun sits at the crown and has some elegant twists that makes it unique. The style has the flattery appeal of side fringes. The hair comes in blonde and has a medium length. 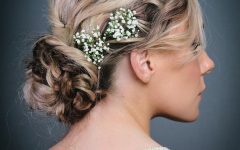 This style has the elegant touch of a double braid that adorns each side. The braids merge into a low bun. This style sports a voluptuous crown and the beauty of side fringes. The hair has ash blonde hue. This hairstyle is a brilliant choice for your weekends out. It requires medium hair to pull off effectively. 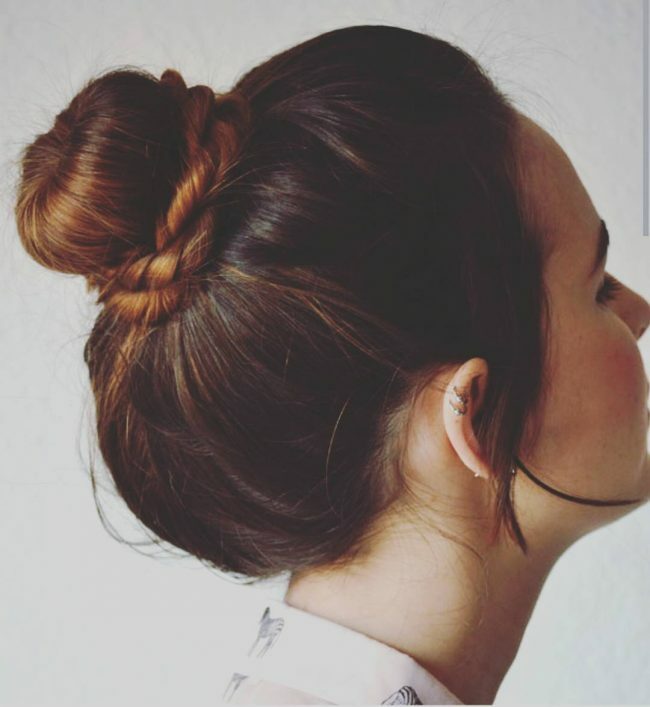 This is a brilliant idea for women that want to go sleek in a bun hairstyle. The locks are layered in two different sections that merge at the back to form a creative bun. The twists given to it create the illusion of a low chignon. This style has the warm look of a brown tone. Here is a lovely bun that is secured with a hairband. The pulled back locks that transition into the bun provide a nice display of the whole face. The style has the elegance of fringes. The hair has shadowy sides with a blonde tone that looks super cool. It is an amazing style for that beautiful woman. This style sports beautifully thinned sides that are given a nice sweep to the back. The crown is given plenty of volume making it hard to go unnoticed. The whole hair ends in a low chignon that sports that messy yet elegant finish. A few strands are left loose to provide wonderful face-framing pieces. 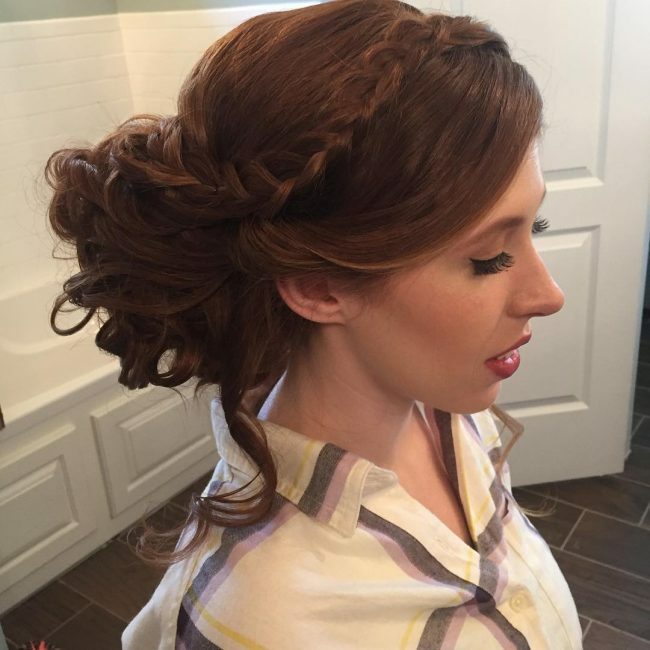 This style can be a great idea for bridal parties. This is a perfect combination of a casual and funky look. Here, the hair is textured and styled into lovely curls at the ends. 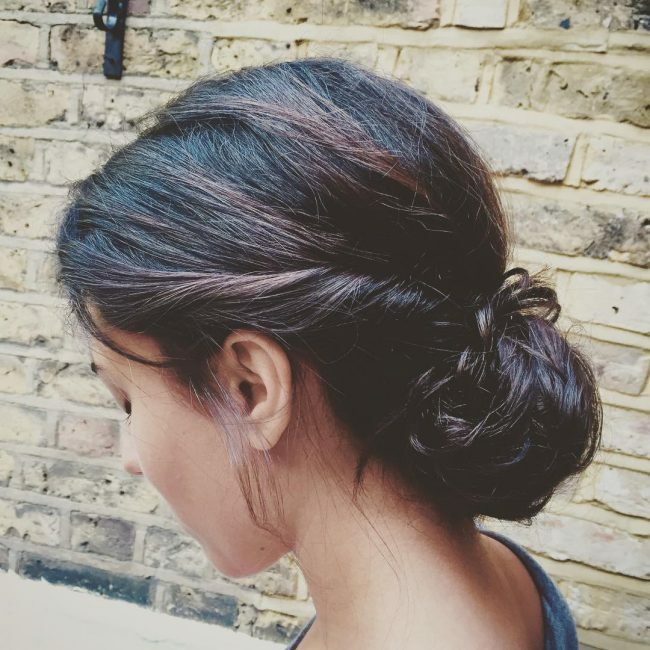 It is pulled back into a messy bun and given a slight shift to the side. Hair accessories are clipped on to add some sparkle to the dark hair that has balayaged highlights of blonde. Medium locks work best for this style. A single bun is not enough to make this style pop. The hair is styled into 3 different sections. Each section is wrapped into a bun. The top section is teased to keep the hair back. The hair is finished with a spray to give it more hold and make it fabulous all day long. The locks are given the cool touch of a blonde tone. Have no time for perfection? Well, this might just be the right style for you. It sports a voluptuous bun that stretches from the crown down to the neck. 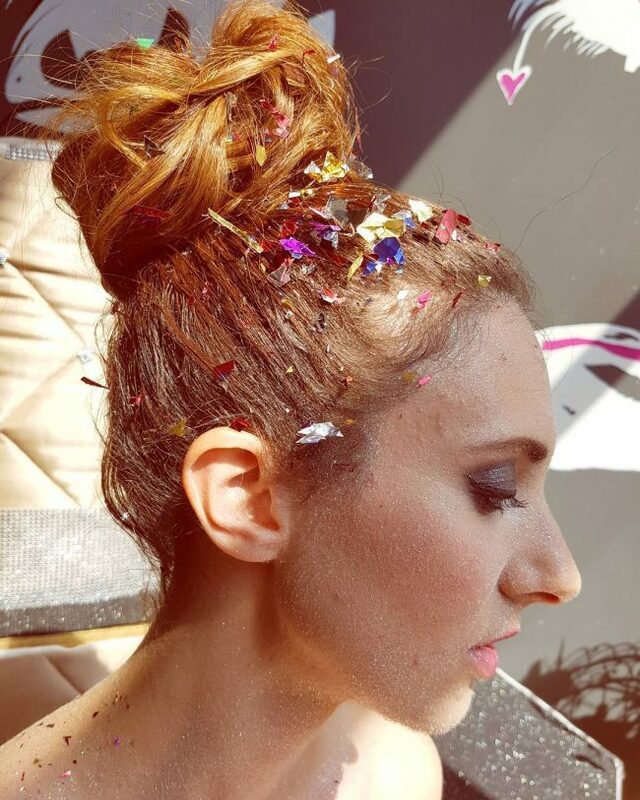 The style is given a sparkle of hair jewelry. The hair sports dark roots that create a shadowy effect on the blonde locks. 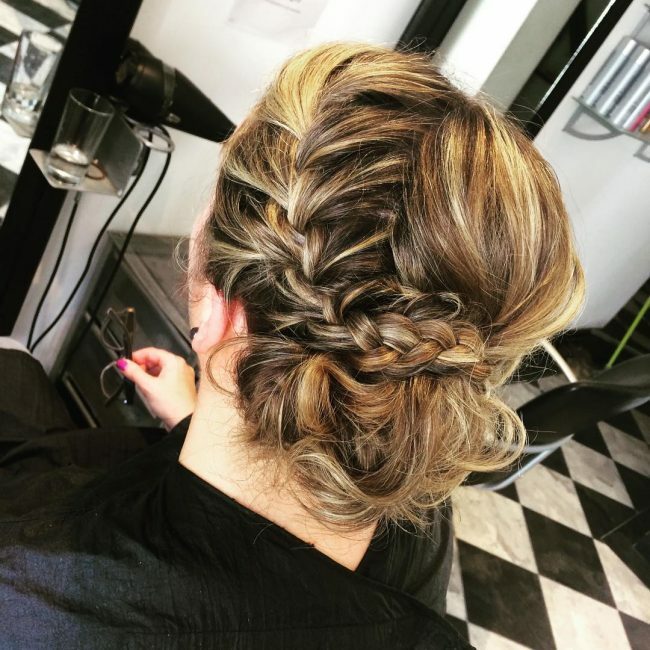 The strands at the front are styled into a Dutch braid that hugs the sides. The braids merge at the back to form a nice crowned look. The top sits high, thanks to the plenty of volume given to it. 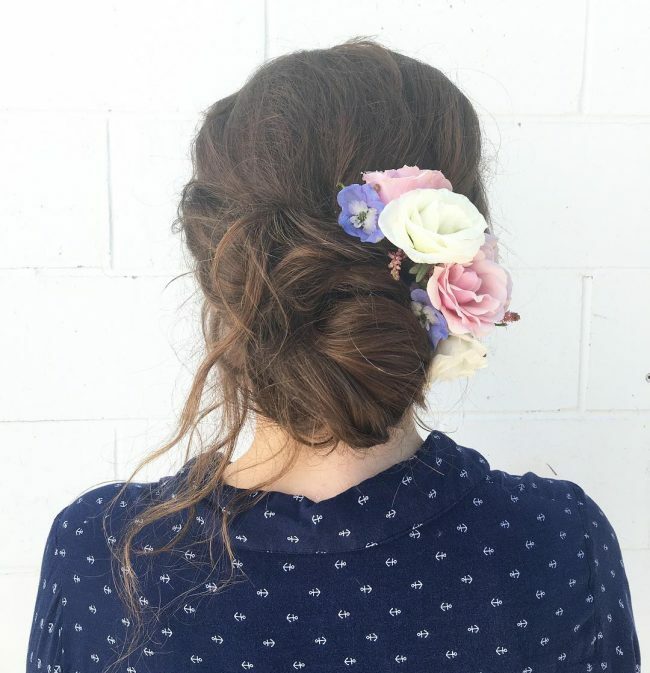 The rest of the hair is pulled into a bun that has the elegant touch of lovely curls. The locks come in blonde with silvery highlights. The front strands are given a Bohemian twist and pulled to the back. The twists merge with the rest of the hair to create a low bun that looks simple yet elegant. The hair sports a dark shade with brown highlights. It provides a chic and super cool look for brunettes with medium hair. Here, the hair is given a soft touch by lots of flyaways. It is creatively pulled up into a doughnut. 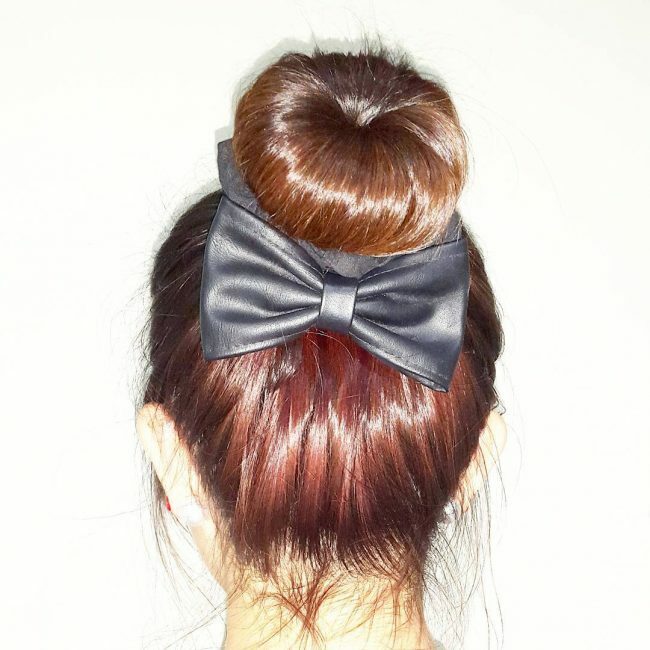 The base of the bun sports a bow tie that adds to its elegance. The hair is given an ombre look that transitions from red to brown. This style is quite easy to pull off and takes only 5 minutes to achieve. The strands at the back are braided starting from the nape of the neck going upwards. 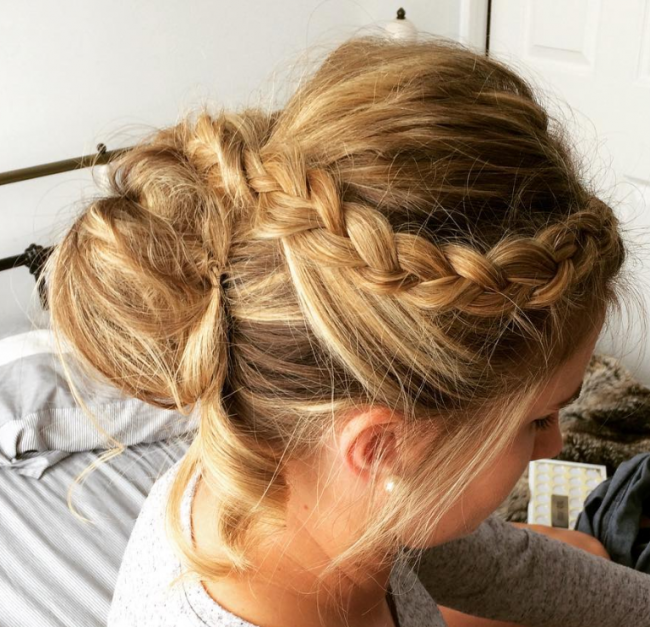 This creates a reverse Dutch braid that adds to the uniqueness of this hairstyle. The braid merges with the pulled back hair to create a nice twisted bun. The dark brown locks are adorned in blonde highlights. Want to be more creative? Well, you can give your bun hairstyle the Mohawk touch. It sits at the top and sports lovely spiral twists created from the curly locks. The dark brown hair has wonderful highlights of pink that give this style a funky look. 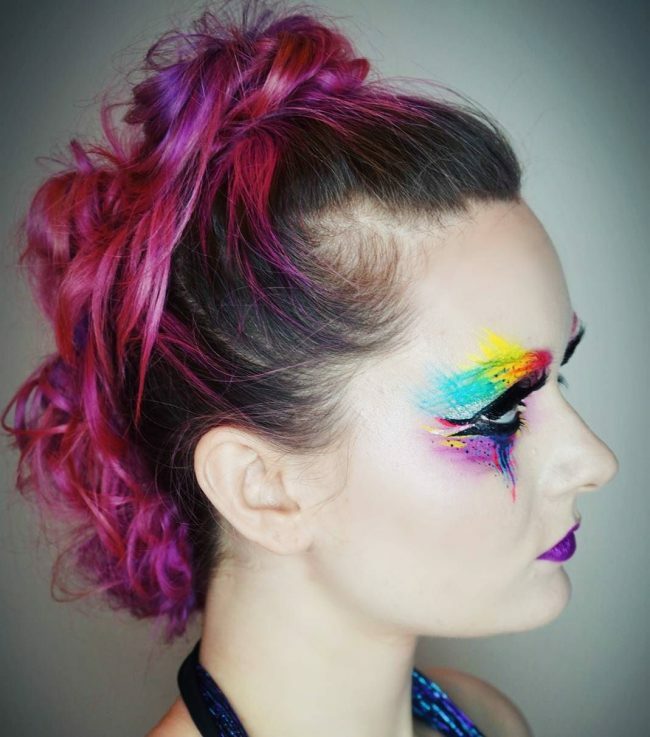 The eyes are painted to provide a rainbow look that goes well with this style. This style creates a wonderful look in a delicate ombre. It sports sleek hair that is pulled up into a sectioned bun. Flyaways provide a soft touch and add to the visual appeal of this hairstyle. The locks have a rustic blonde to golden blonde ombre. It is a classic style for women who desire a casual hairstyle that is maintenance free. 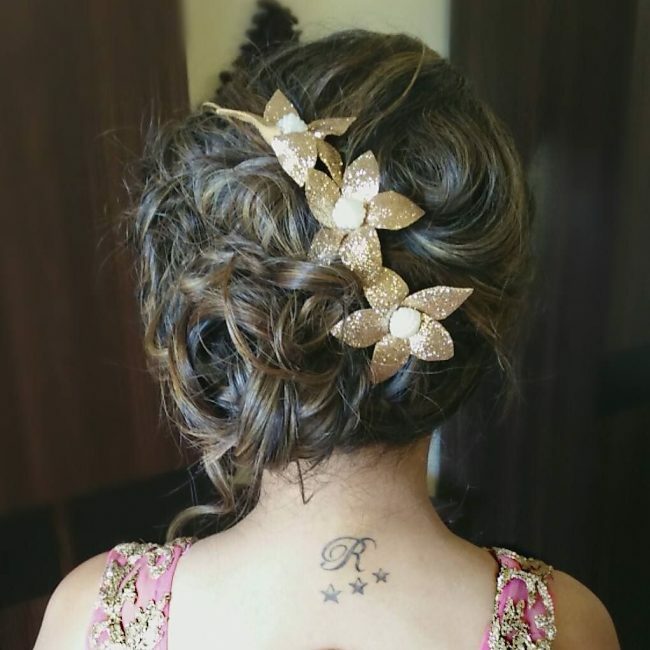 This is an intricate style that will definitely rock in any wedding party. Part of the upper layers at the front are transformed into lovely side bangs. The rest of the hair is sectioned and secured in a curly bun. 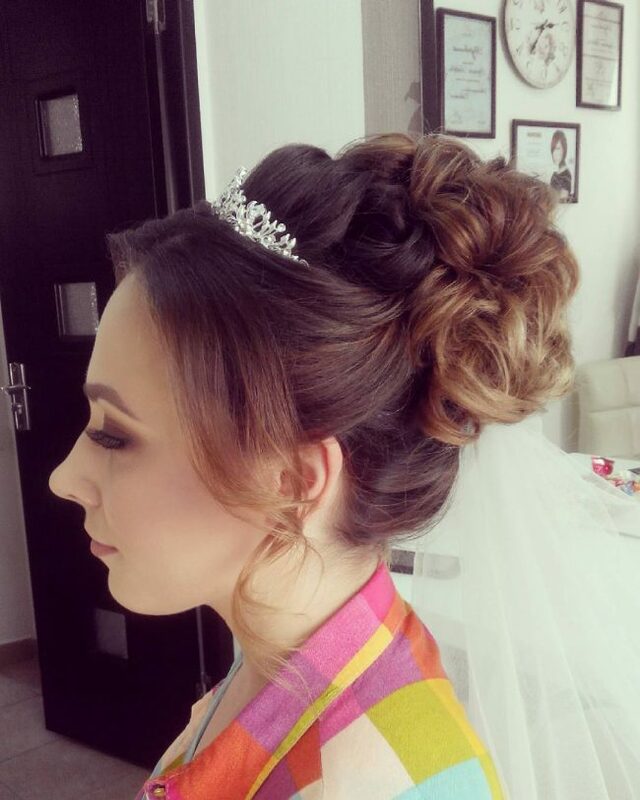 Hair jewelry is added to the top to create a perfect wedding look. The hair sports a wonderful dark brown to blonde ombre. Here, the strands at the front are dispersed to provide a wider coverage. They are pulled back to merge with the rest of the hair ending in a cool low bun. The hair has beautiful waves at the ends. Side bangs create an elegant finish that is both cute and flattery. 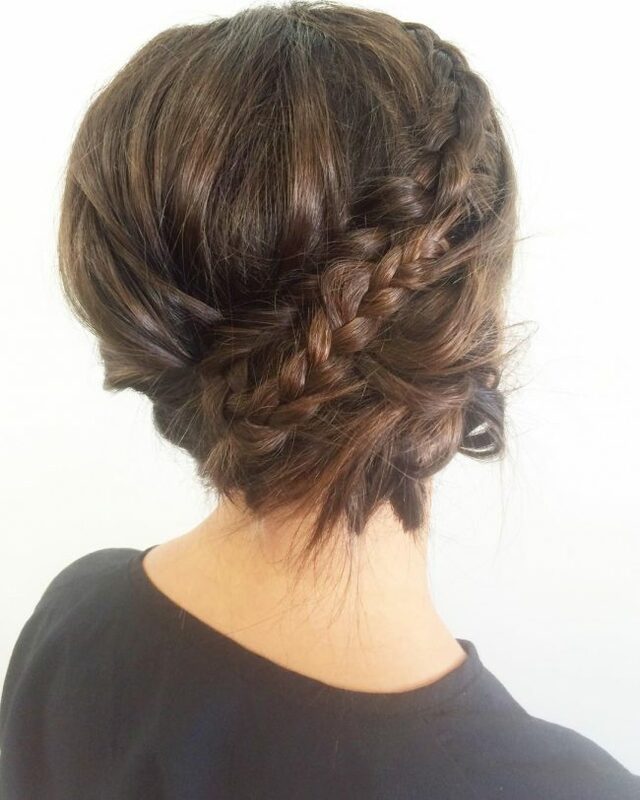 This style sports a three-strand braid woven at the back. The braid runs from the nape of the neck to the top. The sides are pulled up into a curly bun located at the top. This hairstyle creates a slim profile and requires medium hair to get it right. The hair is pulled into a high doughnut. The nape of the neck is given an undercut that forms a unique triangular shape. 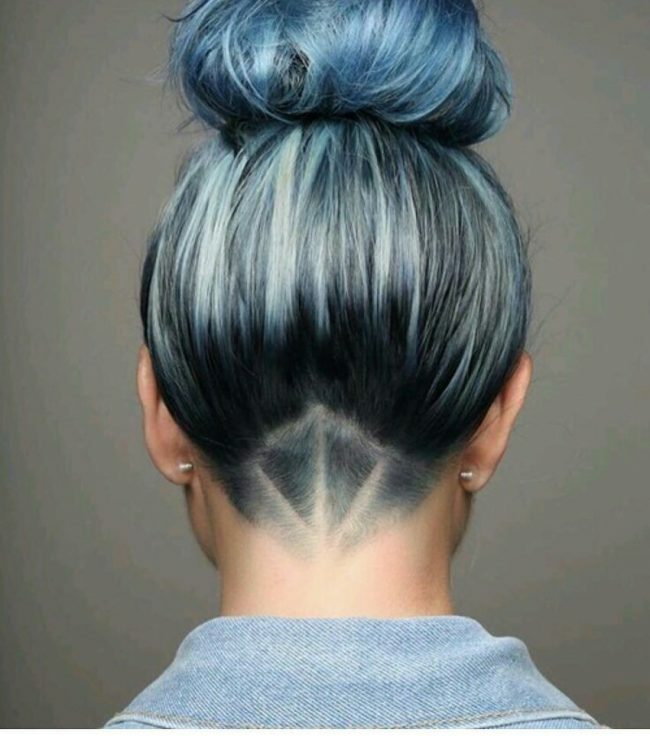 More fun is added in this style by giving the dark hair a vibrant touch of blue highlights. This style is a great idea for bold women who are looking for something to show off. This style sports a side part that creates a border between the top and the right side. The hair on the top and the left side is pulled into a messy bun located at the crown. The right side is combed to provide that sleek look. It creates the illusion of a bunned bob haircut. 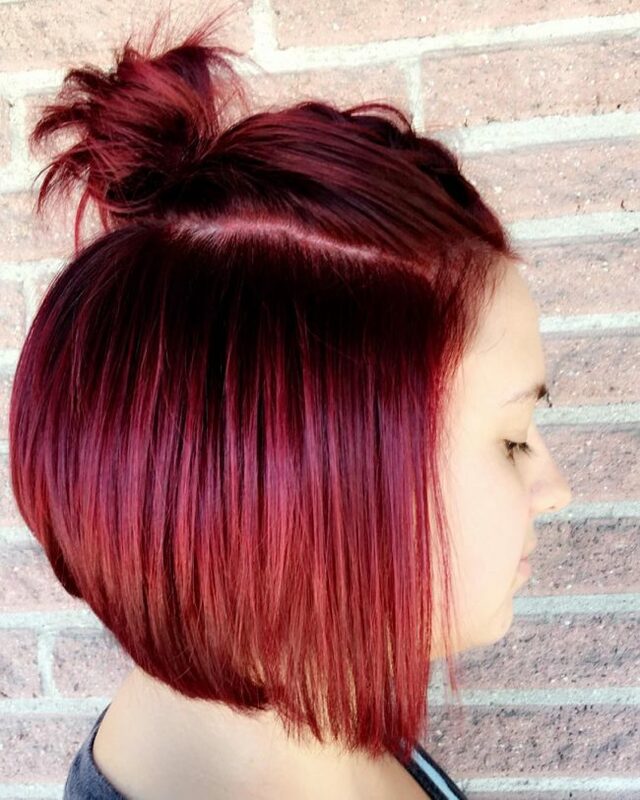 The hair has a red tone that looks great in the sun. This style is a nice choice for women with short hair. Here is an effortless way of upgrading the looks of your hair. This style sports a natural blonde hair that has a separated top and bottom layer. The hair is pulled back into a simple bun. It looks effortless but has all it takes to drive your admirers crazy. This blonde girl has all it takes to drive more attention her way. Here, the hair is textured and styled into curls that adorn the ends. It is pulled up into a bun that has a loose twist to it. The hair has lots of wisps that make the style even more flattery. The whole look is finished with a flowery khaki cloth that wraps around the head. This style provides the elegant and flattery look of front bangs and a side fringe. The hair is parted at the center and pulled back into a side bun. 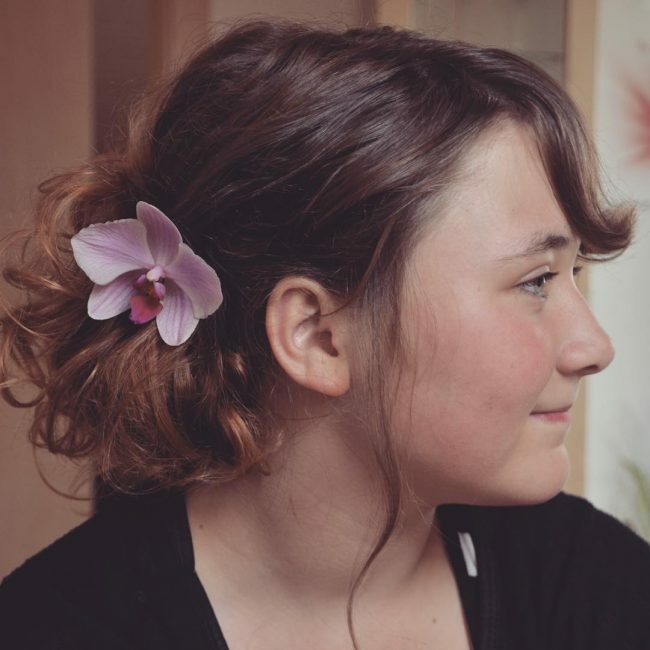 A pink flower is clipped on to create the perfect mood for a wedding party. The hair sports an ombre look that transitions from a dark brown top to blonde bottom. Here, the hair is given plenty of dose in the world of bangs. The bangs are styled from the parted front hair. The rest of the locks are styled into a cute bun that has an elegant spiral look. The hair is given a blonde touch that makes a perfect everyday summer wear. This style sports a nice part at the center. The strands at the front are woven into chunky Dutch plaits. 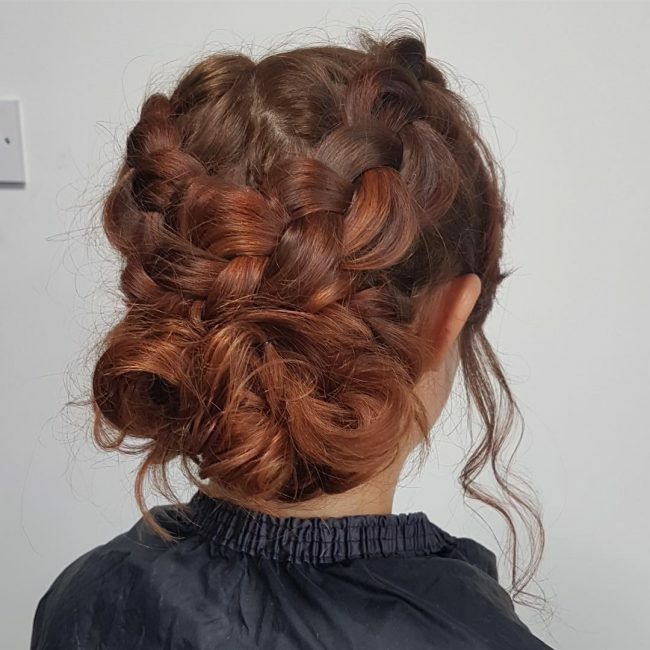 The braids merge at the back to form a curly yet messy bun. Face-framing pieces hang gracefully from the braids. The hair is given an ombre touch that transitions from auburn at the top to copper at the bottom. Here, you get a style that looks quite simple and effortless. The hair is given lots of texture to create wonderful curls at the ends. It is pulled back into a cool bun. A soft touch is achieved by leaving lots of flyaways in the hair. This is a nice take on an ombre style that transitions from dark brown to brown. This style calls for that daring woman who isn’t afraid to have eyes fixed her way. 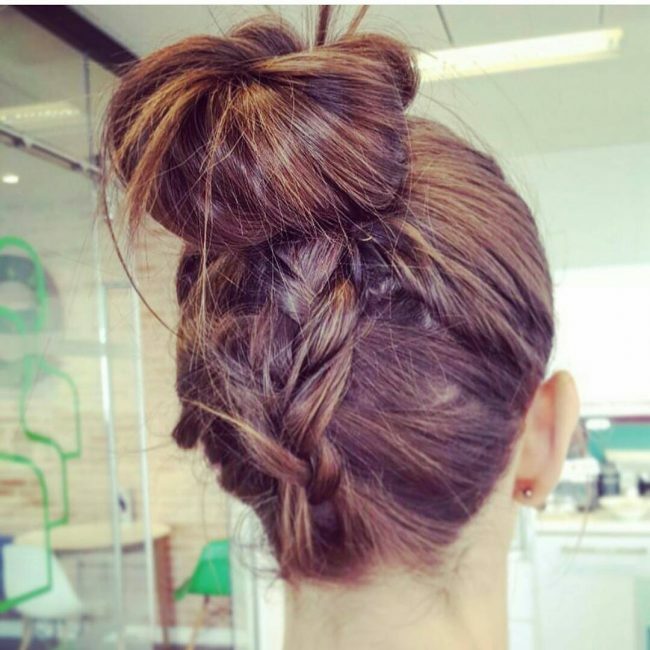 The locks are pulled up into a bun that has lots of twists to it. Glittering hair accessories are stuck on the locks to give them a more shinier look. The hair sports a wonderful transition from rustic blonde to an eye-catching golden blonde tone. This is a style for women with medium hair. This is a nice way of adding some sophistication to your looks. Here, the hair is given that sleek look and parted into sections. It has cute cornrow braids on the right side. 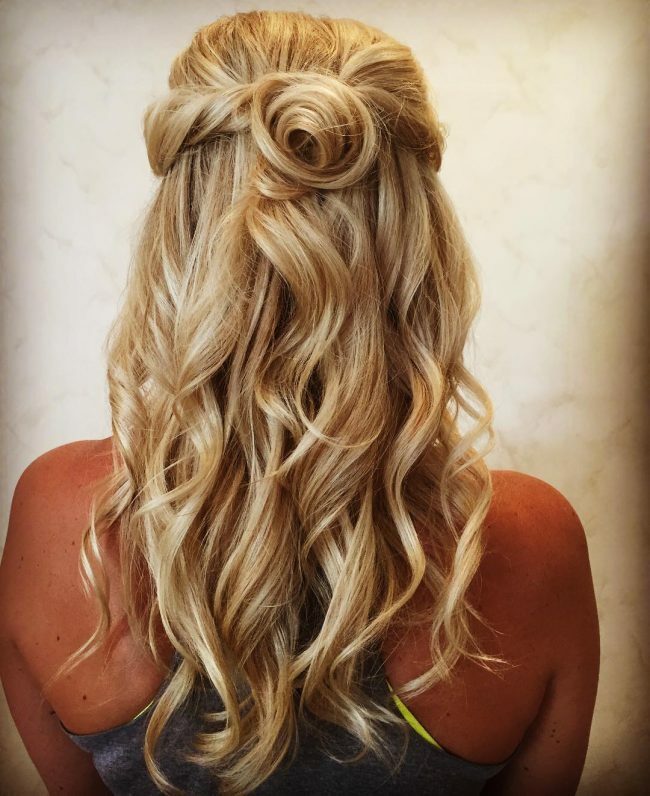 The curly hair is bundled together and merged into a bun that is given a slight side sweep to the left. This is a pretty gorgeous style that requires lots of volume. 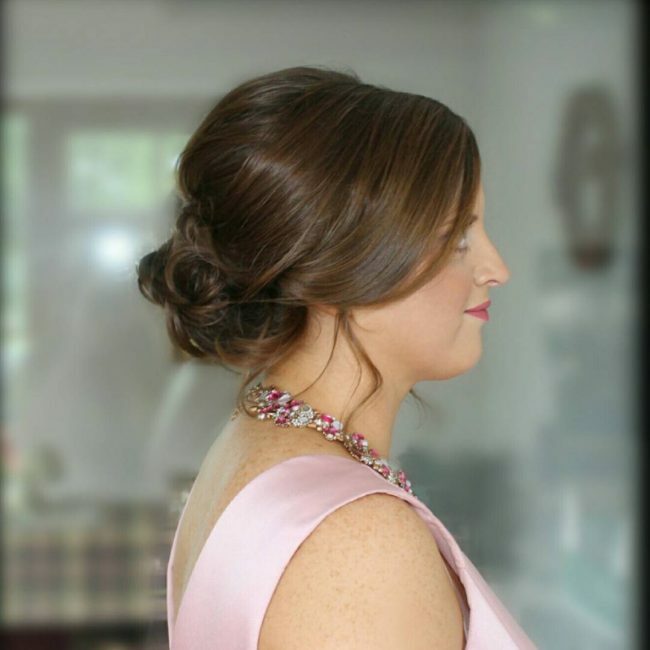 Want to transform your bridesmaid look into that of a gorgeous Disney princess? Well, here’s how. The hair is styled into lovely contoured waves at the ends. The strands at the front are woven to create a perfect crown braid. The braids merge with the pulled back hair to form a bun that has curly extensions. This hairstyle calls for long hair. It is not the sides bangs that make this hairstyle stand out but rather the dramatic pushed back bun. It is elongated and slightly plaited to give it a more classic look. The hair transitions from shadowy roots to blonde creating a nice ombre touch. It is a style for women with medium hair. This style is simply sweet, thanks to the fresh finish given to it. The hair is pulled back into a bun with extensions. It is given the fresh look of pink, white and blue flowers. It’s actually an elegant way of embracing those joyous moments in a wedding party. 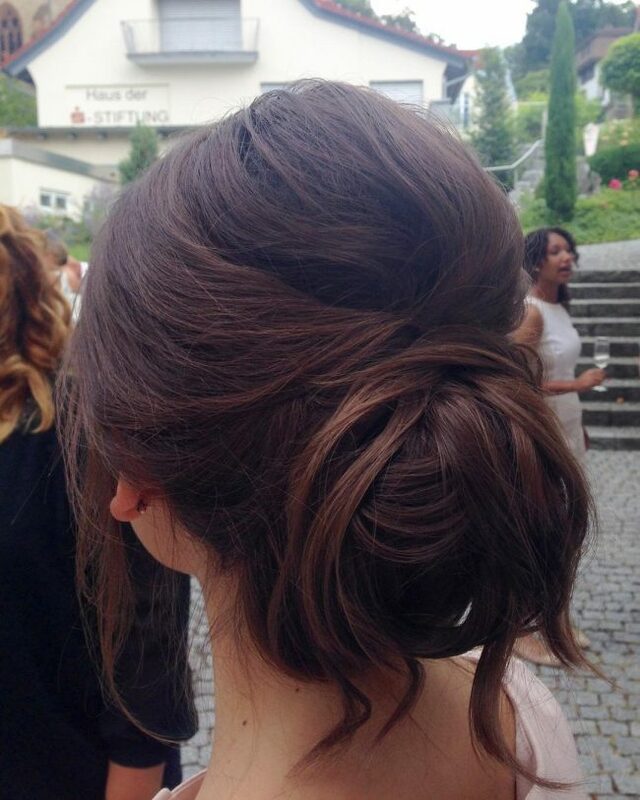 Here is an elegant tousled-up bun styled from dark brown hair. It has that modern and classic look that is simply irresistible. The hair is textured and given curly ends that add more fun and interest in this style. The higher the hair the better. And what an elegant way of achieving it than with a creative high bun? Well, this mermaid hair sports a double side part that connect to isolate the top. It is from this top hair that the elevated bun is created. The rest of this blonde hair is left to fall gracefully on the shoulders. It is a great style for ladies with medium hair. Here, the front strands are braided some few inches from the forehead. They are partially concealed by the locks at the top. The hair forms a perfect merge at the back to adorn you with a messy and curly bun. Cascading side bangs do much in adding some more flavor and drama in this style. Have you ever had those bad hair days? Well, here’s how to cope with them. Give your hair tons of texture with lots of curls to upgrade your looks. Leave some side bangs to grace the front with their flattery appeal. The rest of the locks are pulled back into a low and loose bun. 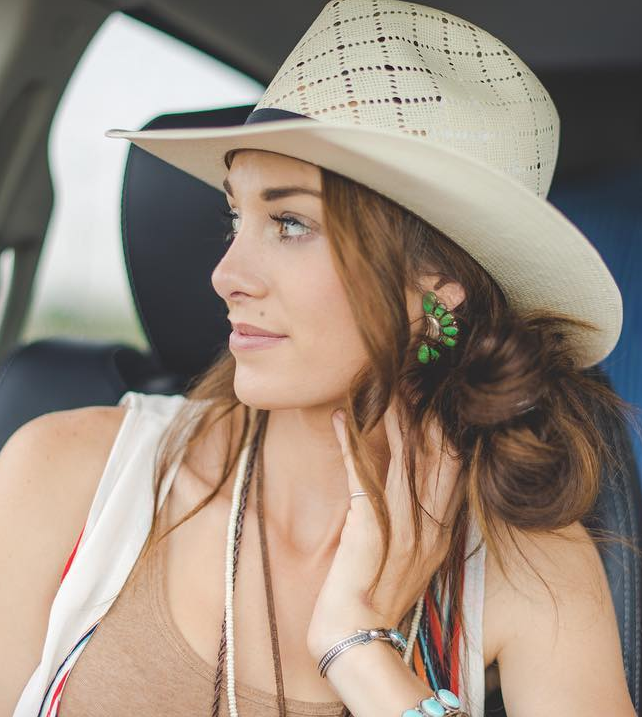 Top up the whole look with some cowboy hat and you are good to go. 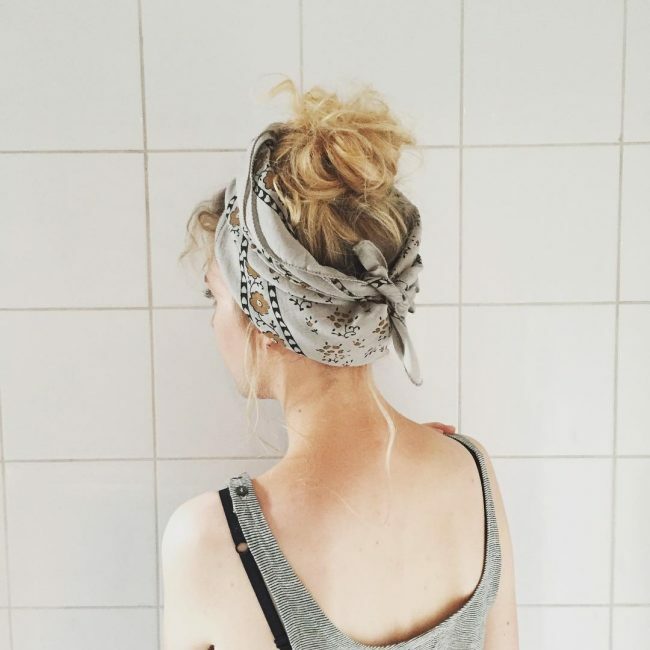 This style takes the concept of a messy bun to the limits. It sports a top knot bun with lots of flyaways that create more of a wild look. The hair has a dark brown to blonde ombre. Some jewelry worn around the neck blend in to provide some sparkling look in this sweet hairstyle. Here is a trendy hairstyle for the summer season. It sports the dramatic touch of a side swept bang that rests gracefully over the ear. The rest of the hair ends up in a high bun that has lots of volume to create a good visual impression. The hair is dark brown and sports tan highlights that add more vibes in this hairstyle. 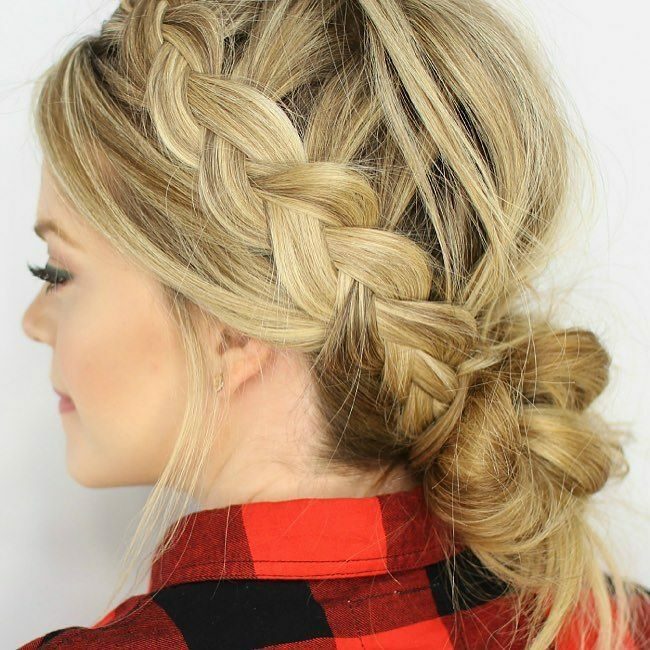 This style has the classic touch of double braids that hug the right side. The braids are given a diagonal twist that add more sophistication to this hairstyle. Everything is nicely bundled into a curly bun that sits low on the nape of the neck. The dark brown hair has balayage highlights of blonde that make it stand out. This is a super cool hairstyle. The hair is pushed to the back leaving only a few face-framing pieces at the front. It sports lots of volume at the nape of the neck. The hair merge into a curly bun that looks fabulous. The locks have a dark brown tone. This is a style for medium length hair. Jennifer Lawrence decides to add some bang to her gorgeous looks. She gives the bags a sweep to the side. The bangs merge with the rest of the hair into a secure low bun that is given a slight sweep to the left. She adds on some sparkling earrings to drive her admirers crazy. Nicole Kidman has some specials for lovers of the bun hairstyle. She keeps her rustic blonde hair sleek and adds the glamorous appeal of golden blonde highlights. The sides are given a nice sweep to display the high level of attention she gives to her hair. 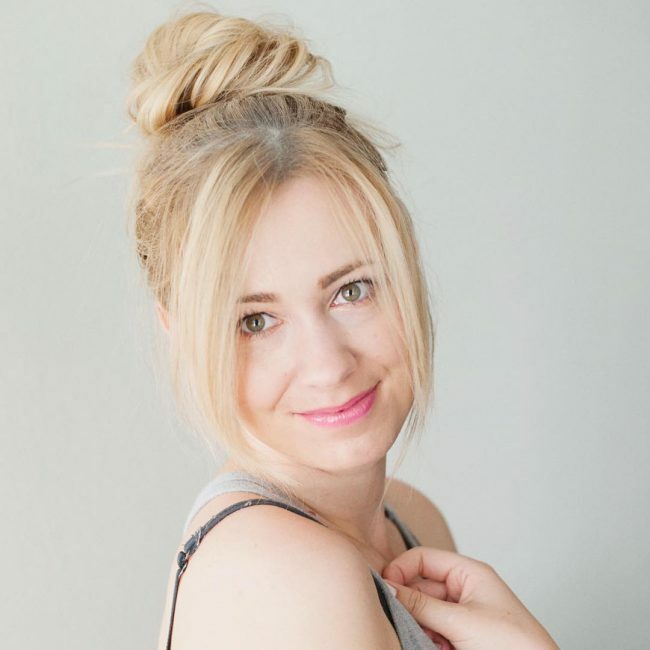 The locks end in a side bun that has the elegance of cute spiral twists. 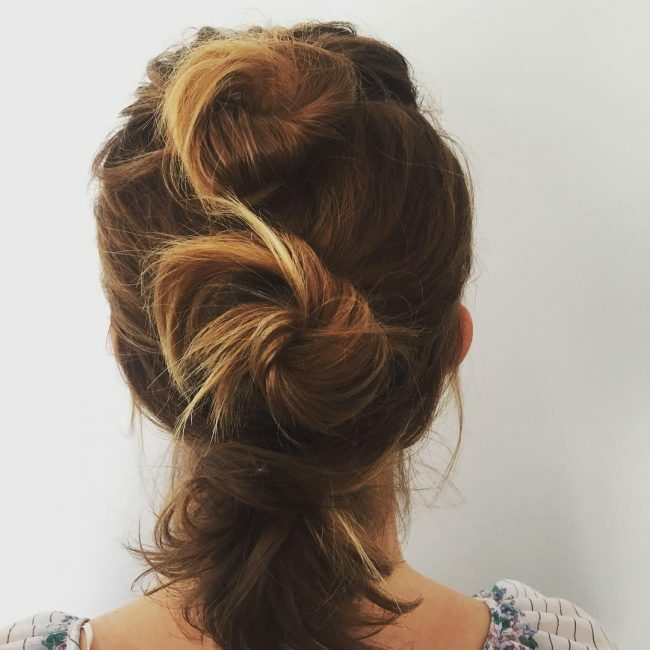 Amy Adams leaves nothing to chance in the world of messy updos. She chooses to keep it simple and effortless. She parts her sleek hair and pulls it to the back leaving a few face-framing pieces. 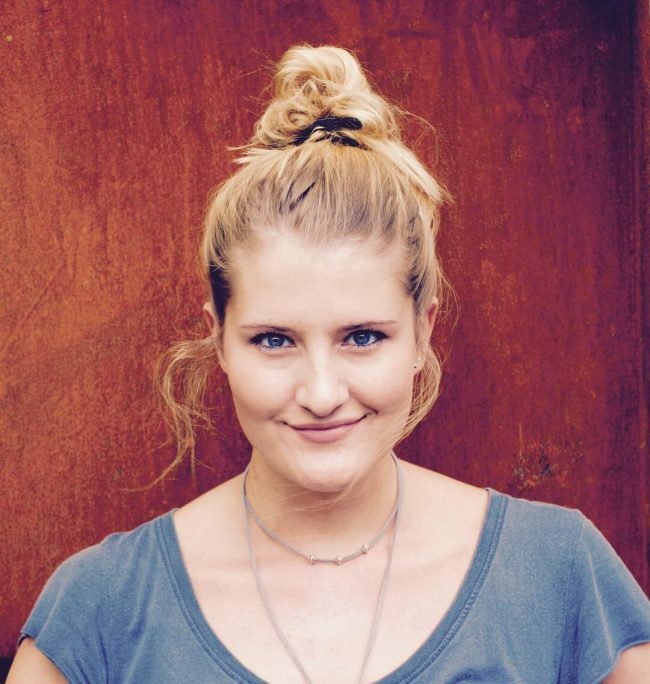 She sports a low bun that basks in the radiance of her golden blonde hair. Rachel McAdams how it is done in the realm of messy hairstyles. She styles the sides into cute cornrow braids. The rest of the locks are pulled into a bun and she uses the double cornrow braids to secure it in place. She leaves some flattery side fringes and completes the whole look with red flowers clipped on the bun. It is the desire of every woman to stay beautiful and feminine. However, the length of the hair can be quite a hindrance to achieving this. But there is a solution to all these — a messy bun. 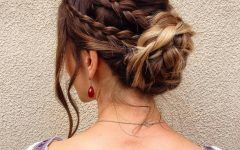 This hairstyle is a real time saver and can blend in regardless of the event that you are planning to attend. It is a comfortable and glamorous option that will definitely rock wherever you go!